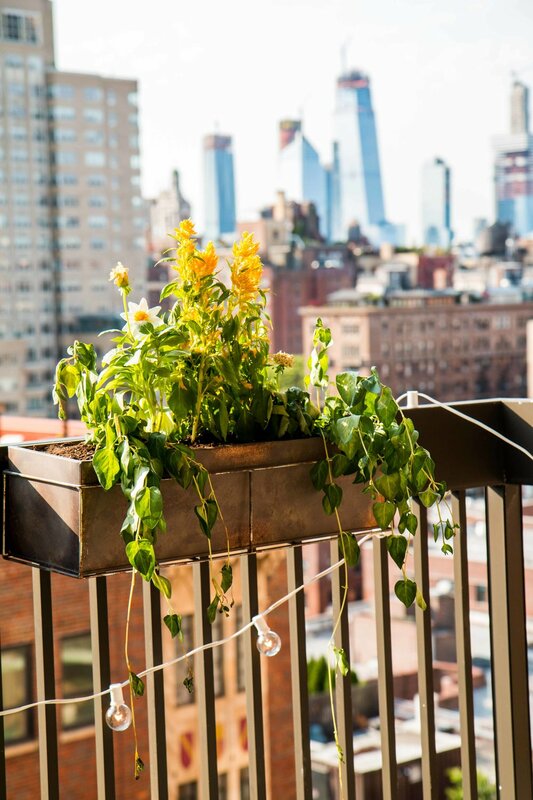 Having outdoor space in your NYC apartment is rare. We didn't move into an apartment with outdoor space until about 8 years ago, when we moved into a two bedroom to accommodate our little man's arrival. Our deck is by no means large. It's a small space but has a killer north facing view right onto the Empire State building. I often joke that I'll die in this apartment building because I can never give up our views. I used to be afraid to let the kids go onto the deck. Made me nervous with them out there with thoughts of them flying off of it. 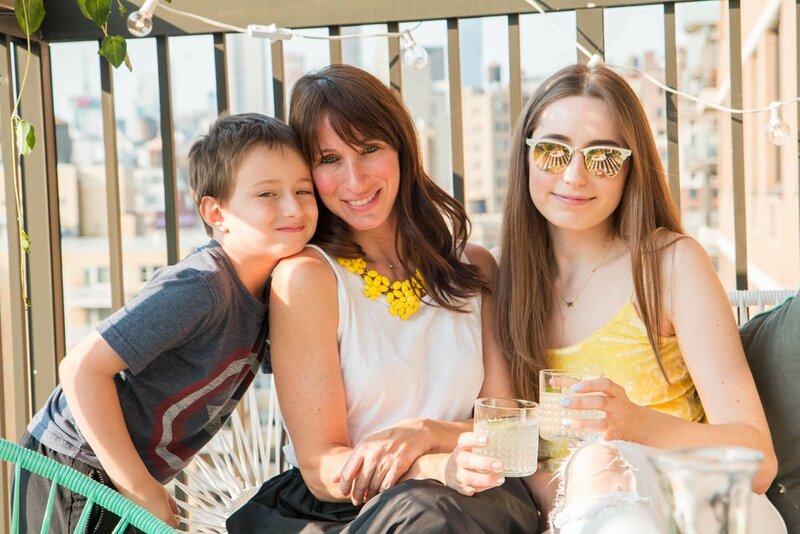 Now, 6 years and two kids later, I feel very comfortable that they are responsible little humans who know better then to climb around out there. So I have finally decided to decorate the deck and I have never been happier! It's like a private, outdoor oasis in the sky. 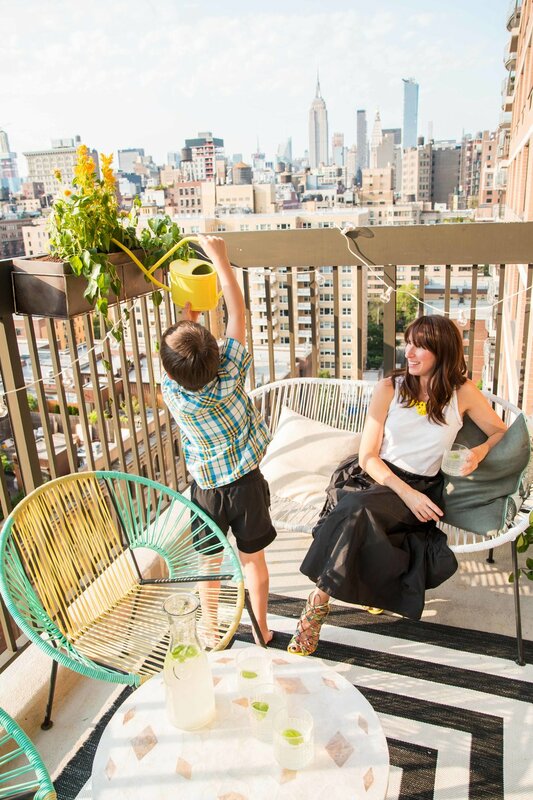 Now we have dinner out there, enjoy cocktails with friends and the kids LOVE the fresh air. The girls and I spent quite a bit of time thinking through the plans for this. First, we measured the deck to find out exactly how much space we were working with. 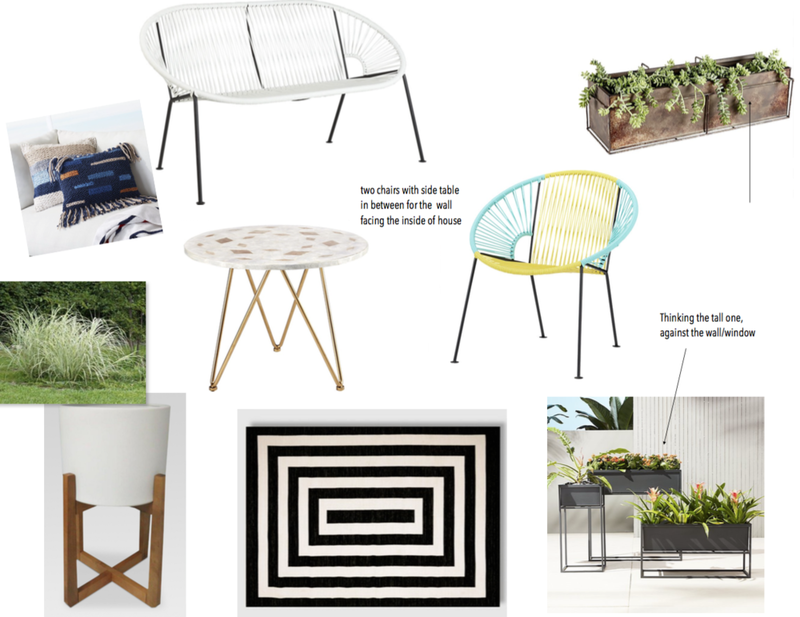 Then, we researched planters and furniture. Then, we put together a mood board to see how our choices would all go together. Once we nailed down the mood board and agreed on the items to order, we measured again for each of the items to make sure they would all fit. White couch - perfect for outdoors, all year, no maintenance required! Small table - we'll probably just bring this inside in the winter to be safe. Next, it was time to get planting! I was thinking we should just buy all of the plants in the flower district because they have a huge selection. However it turns out they were very expensive! SO...we went to our local farmer's market in Union Square and the prices were spot on. Totally reasonable and they had a great selection. We knew for the larger planters that we had for the ground we wanted tall, dramatic, outdoor plants that could hold up in the wind. 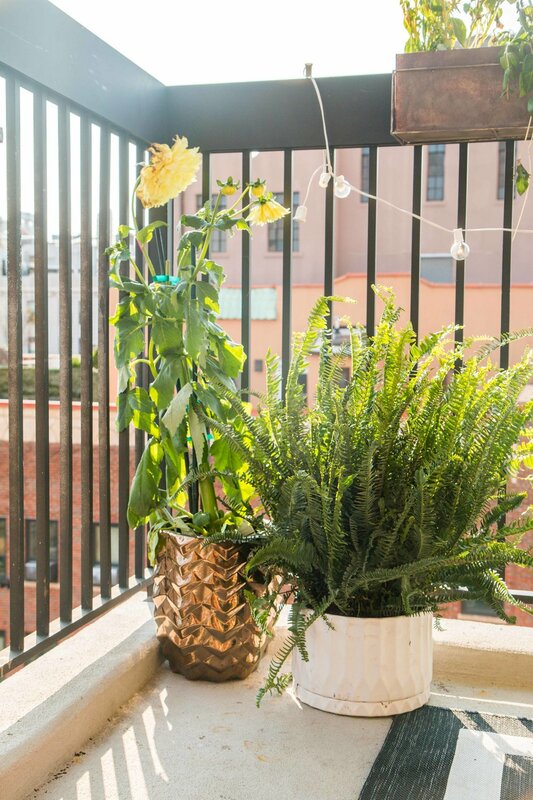 We found a big dahlia, a gardenia and a fern that were so perfect for our large planters. For the box planters, two were going to hang off the railing. We found english ivy, a vine-y type plant, that we wanted to mix in with some color. We chose yellow celosia plants mixed with small dahlias that matched the color palette of the furniture that we ordered for the deck. Since I cook a lot, I wanted my very own herb garden at my fingertips. So for the white box planter we got basil, rosemary and parsley. AH! How fantastic is this?! 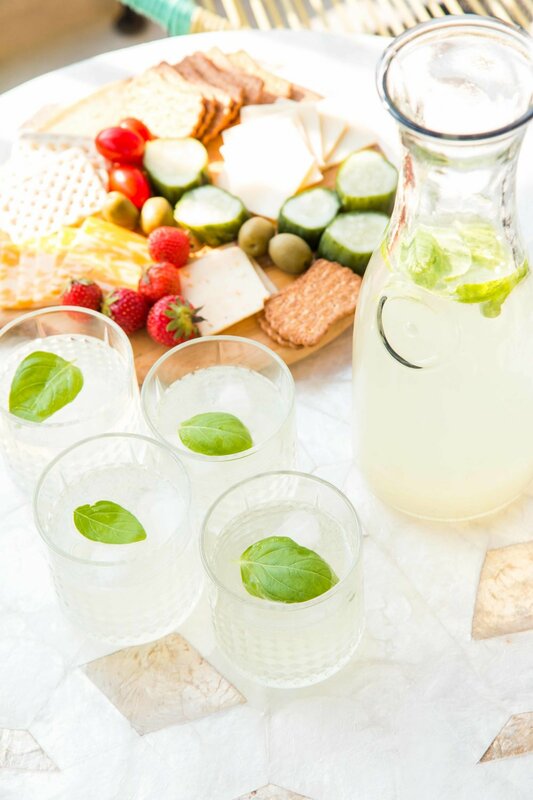 Basil lemonade? Yes please! For the round standing planter, we got a cherry tomato plant and the kids are losing their minds. They love tomatoes and now they can go onto the deck and pick n eat them! Too amazing. To plant all of these - we used Miracle Grow Potting Mix, organic Plant Tone, and Osmocote. 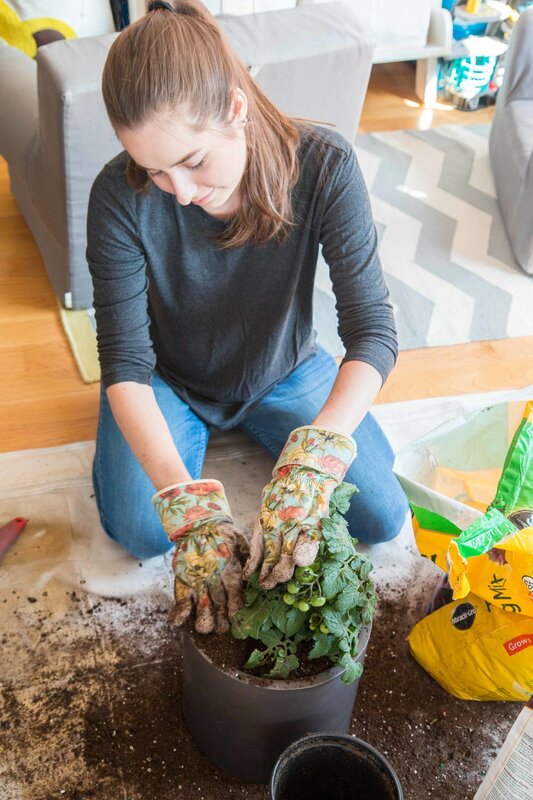 Depending on how much soil you are using, follow the instructions on the back of the bag to mix in the proper amounts of the fertilizer into the potting mix. Once your plants are secured in your planters with the soil mix, sprinkle a little extra osmocote on top and water generously to pack in the soil. You want to make sure there are no air pockets in there, because the oxygen will kill the plant. To care for these plants it will be crucial that we water them every day and add extra fertilizer every couple weeks. 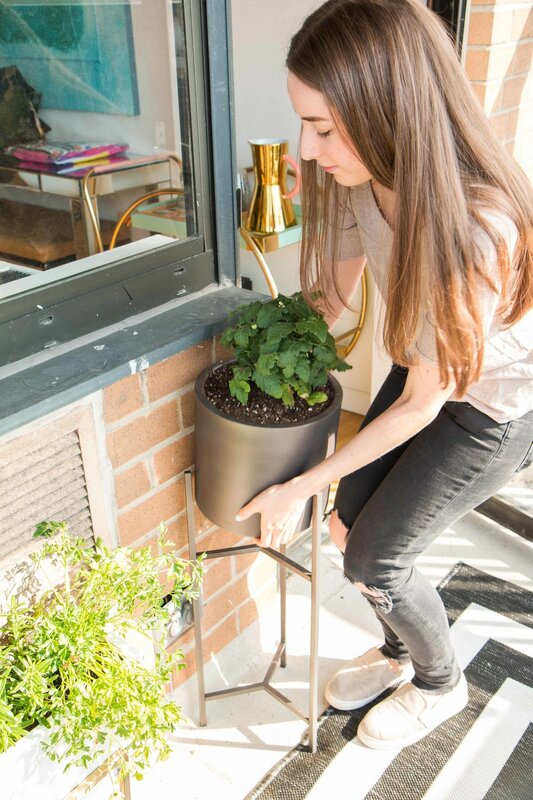 Keeping a close watch of the plants also helps a lot- if they're dry, water them more! If they're staying damp from the rain, leave them be so you don't drown them. Extra thanks to Maggie's dad, Matt, for all the advice on what to use and how to care for our garden! After posting about this deck transformation on Instagram, many of you asked what I'm going to do in the rain. The answer to that is, nothing. ALL of the furniture is meant for outdoors. I will not leave any cushions out there, ever. If we bring pillows out, I'll bring them back inside at the end of the night. As for the winter, to be determined...open to your suggestions if you live on the east coast and have experience with a garden on your deck! For now, I'm just going to enjoy every moment we get out there.